Gloss White 4 in. x 12 in. Ceramic Wall Tile features a striking, glossy sheen accentuating the neutral white color for an easy complement to any decor. The tile is suitable for use primarily on interior walls, such as kitchen backsplashes or on counters. You can easily incorporate accent pieces and decorative border tiles into the design for a customized look to suit your space. To help maintain a clean, beautiful surface, clean with a low-alkaline detergent diluted with warm water; waxes and sealers are not recommended. 10.33 square feet, 31 pieces per case. Case weight is 29.14 lbs. 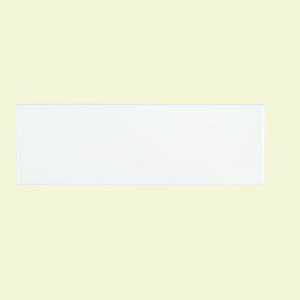 Buy online Jeffrey Court Fresh White 4 in. x 12 in. Ceramic Field Wall Tile (10.33 sq. ft. / case) 96014, leave review and share Your friends.